In order to carry astronauts safely beyond earth’s atmosphere to where they can explore outer space, spacecraft must provide a very important chemical mixture: breathable air. Given the limits on space and weight for a manned shuttle, the systems flying aboard the craft must revitalize the air inside rather than carry the full amount needed for a mission. With this in mind, a team at NASA has developed an approach to atmosphere revitalization that relies on water adsorption. There are many steps to the process of revitalizing the atmosphere: separating oxygen from CO2 to re-use the O2, ejecting CO2, collecting moisture, and condensing liquid water for re-use. Jim Knox, an aerospace engineer at NASA, led a team that worked to make the revitalization system more efficient and cost-effective. The Isothermal Bulk Desiccant (IBD), tasked with saving water from the air, contains a series of channels lined with silica gel — the same stuff in those packets found in shoe boxes and certain packaged foods that say “DO NOT EAT”. Silica gel is a desiccant, absorbing moisture readily, which is why it is often used to preserve perishables or prevent water damage. When air flows into these channels, or packed beds, water from the air is exothermally adsorbed onto the gel. The beds are arranged in an alternating “wet” and “dry” configuration: dry beds draw water out, drying the air and saving the water; and wet beds return the water to the air. After flowing through a dry bed, the air continues on to a CO2 removal system before returning, CO2-free, to the wet bed where water desorption occurs. Between each pair of beds lies an aluminum foam lattice, which allows heat (caused by the water adsorption in the dry bed) to be transferred to the wet bed. The heat transferred causes the water to desorb from the silica gel in the wet bed, returning it to the air. Maximizing the efficiency of the IBD means maximizing the amount of water it saves — the goal of Knox’s team was to save 80-90% of the water from the air. 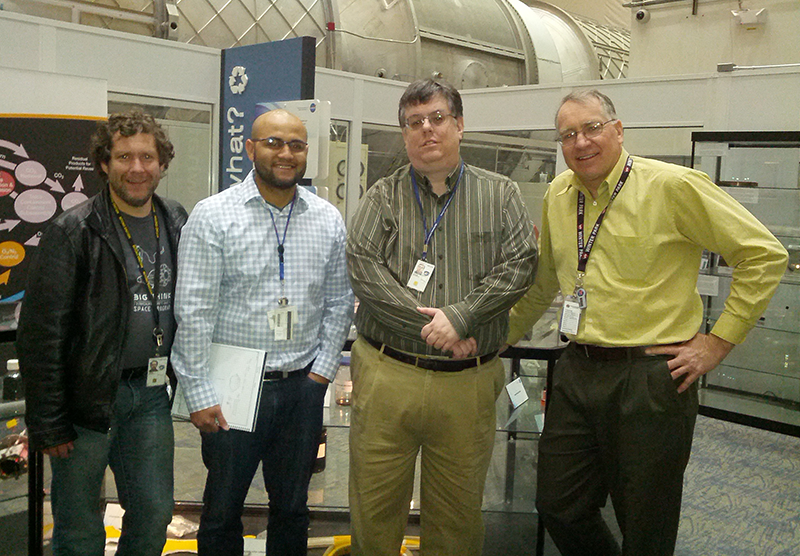 The team at NASA used COMSOL Multiphysics to model the gas flow and water concentrations in the IBD. 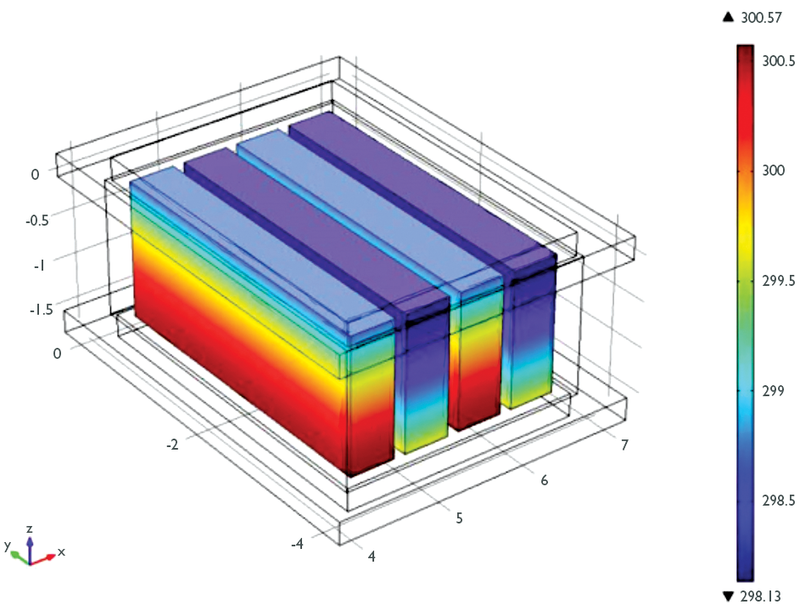 They simulated the bed conditions on geometry imported using LiveLink™ for Pro/ENGINEER®. 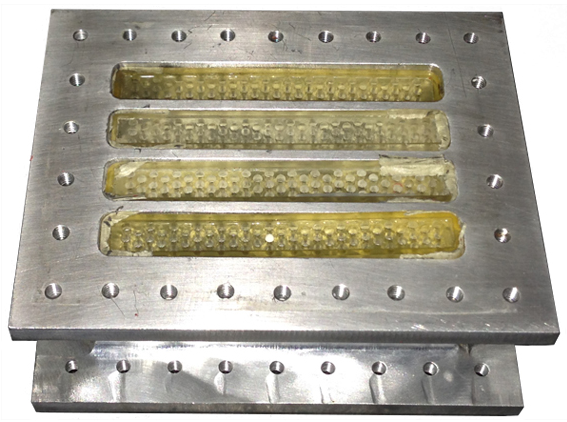 “COMSOL let us perform this kind of multiphysics simulation on intricate geometries […] we needed to simulate porous media flow in the beds and heat transfer in multiple materials, input pressure boundaries, and find sorption rates,” said Knox. Simulation of the IBD showing the temperature (K) in each bed. The first and third channels are wet beds, the second and fourth dry beds. Rob Coker, another member of the team, used a breakthrough test to calculate the IBD efficiency. Pumping air through the dry bed, he kept note of the water vapor concentration and of when the humidity level at the outlet reached the level at the inlet. At that point, the silica gel could hold no more water. Their simulation tracked the flow rates, water concentration, and pressure boundary conditions for inflow, outflow, and wet and dry air. The results reported that the IBD collected 85% of the water from the air passing through it (via the dry beds) and returned it (via the wet beds) to the atmosphere. 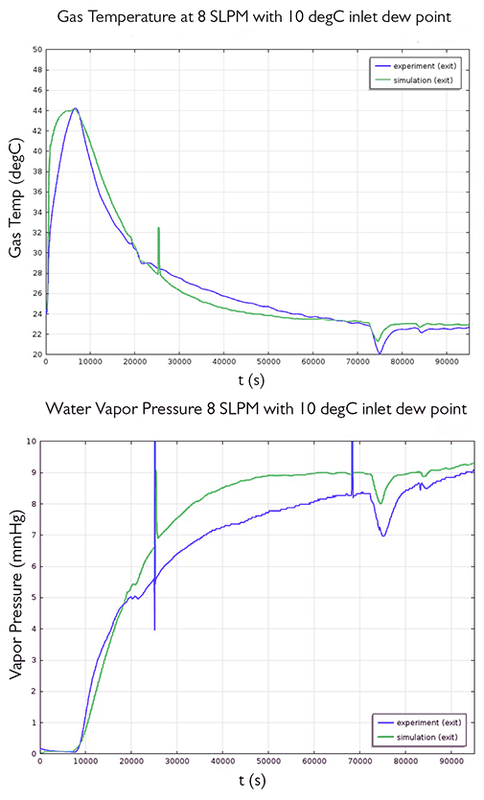 Simulation of air flow at the exit showing the gas temperature (top) and the water vapor pressure (bottom). The COMSOL Multiphysics simulation gave Knox’s team guidance for designing and optimizing the water-saving assembly as part of a larger system for revitalizing the air in a spacecraft’s atmosphere. While working to minimize the power requirements and maximize the water saved before the CO2 is removed and ejected, they also hope to design new systems for the separation of CO2 and oxygen, further reducing the amount of air that is carried on-board. With them at the helm, aided by COMSOL software, we’ll soon see longer and farther space missions leaving orbit. You can check out the full article, “Simulation Helps Improve Atmosphere Revitalization Systems for Manned Spacecraft” in the most recent edition of COMSOL News. PTC and Pro/ENGINEER are registered trademarks of PTC Inc. or its subsidiaries in the USA and in other countries. All other trademarks are the property of their respective owners. For a list of such trademark owners, see http://www.comsol.com/tm. 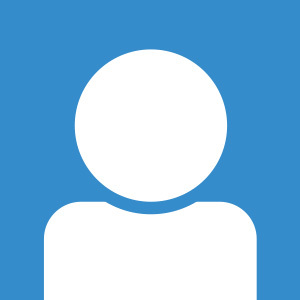 COMSOL AB and its subsidiaries and products are not affiliated with, endorsed by, sponsored by, or supported by these trademark owners.